Starting April 16th at 5 pm until April 19th the FCDMC will be performing maintenance on the FLO-2D Web Access Tool. During this time access to information for the various studies included on the site may be unavailable. If you have any questions please email them to FCDSpecialproject@mail.maricopa.gov. The FLO-2D Web Access Tool was developed by the Flood Control District of Maricopa County and allows our client agencies, consulting engineers and the public access to two-dimensional (2D) model results from District ADMS(P) projects in a user-friendly Internet-based framework. Users can access model results visually, and obtain a variety of technical information that can be viewed, downloaded and/or printed. Expensive software licenses and expertise in GIS or the 2D model software is not needed. 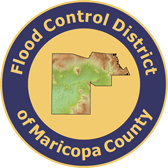 If you wish to speak with someone about flooding issues in Maricopa County, contact the Flood Control District of Maricopa County at (602) 506-1501.